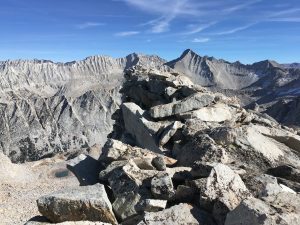 With the continuing dry weather in the Sierra, I looked around for another SPS peak I could climb without too much driving, and settled on Recess Peak. 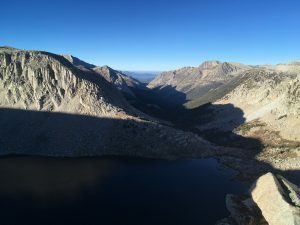 While it is most quickly reached from Lake Thomas Edison to the west, it also looked like a reasonable day out of Rock Creek via Halfmoon Pass, Mono Creek, and Second Recess. It turned out to be a comfortable 26 miles, with the crux being the pass, and the cross-country travel in the upper Second Recess quite pleasant. My knee was bothering me a bit (finally! ), so I didn’t do much running, but still made it without a headlamp despite the short days. I woke up earlier than I had planned, and spent the extra time cooking a real breakfast before driving up to the parking area just below the pack station, where mine was the only car. I sat in my warm car for a few minutes, then finally summoned the courage to step out into the cool morning near 10,000′ just before 7:00. 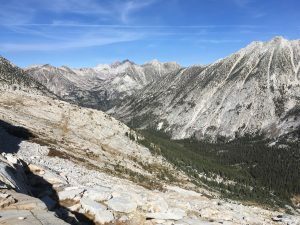 I had only done Halfmoon Pass once before, on my way out from Mono Rock on my first Sierra Challenge, and I knew it was quicker than Mono Pass. I could see it from the road, but still wasted a fair amount of time looking for a use trail before just taking off up-slope through mostly easy forest. There are some willows, but they are easily avoided on the right-hand side. One short class 2-3 scramble later I was at the crest, looking down on Golden Lake. As I later found out, there is an easy route down the other side from a notch. However, I was somewhat right of that notch, and ended up descending a nasty class 3-4 mix of sand, loose stuff, and outward-sloping lichen-covered slabs. It worked, though, and I was soon on the use trail down to join the main pack trail at Mono Creek. I followed the trench full of pulverized dirt down past Fourth Recess and a couple of unfamiliar trails, cutting the horizontal switchbacks when they became too annoying. It was a bit cool in the shade, but perfect t-shirt weather in the sun as I made my way down-canyon. My knee was acting up a bit, so I mostly just hiked, calculating that I would still make it back before dark. My map showed a trail up Second Recess, so I left the main trail near where it should be, found a suitable log to cross Mono Creek, and soon picked up a somewhat faint trail with a few footprints on the other side. The path climbed gently along the left side of the creek, which flowed under thick white deposits of ice for much of its length. It gradually faded farther up-canyon, but the cross-country travel was mostly easy. Not having my copy of Secor’s guidebook with me, I did not know what the routes were like from this direction, but the line I had quickly drawn on the map turned out to be quite pleasant. 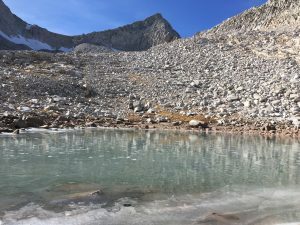 I climbed some slabs north of the northeast ridge, crossed at a broad shoulder, then continued past a small, mostly-frozen tarn toward the peak’s east face. This was the only part that looked steep on the map, but an obvious class 2-3 chute led to the saddle south of the summit. I checked out both of the possible high-points, but did not find a register on either. From the summit crest, you can see Lake Thomas Edison not very far to the west, and the impressive, bare, glacially-carved First Recess to the north. To the east, the high summits of Hilgard and Gabb dominate the view, with Julius Caesar peeking out behind. I took the time to eat a sandwich, but did not hang around long, since the short day would have me coming perilously close to evening headlamp. The hike back was pleasant and uneventful, with the afternoon sun giving the granite cliffs a pleasant glow. 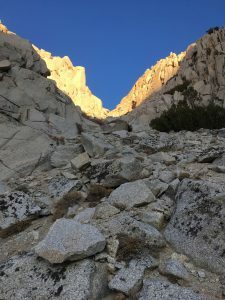 I got a final taste of sun near the top of Halfmoon Pass — the correct one this time — then picked my way down the other side as fast as I could, racing the rapid onset of headlamp time. I repeatedly found and lost a sort of trail, finally emerging behind the closed pack station at dusk. I saw only two other cars on my drive down Rock Creek; once again, I had the Sierra almost all to myself. That is Cool Ice. Is the top layer of ice smooth and the bubbles completely below the surface? I didn’t pet it to find out, but I’m pretty sure the top is smooth, with vertical columns of bubbles trapped beneath. 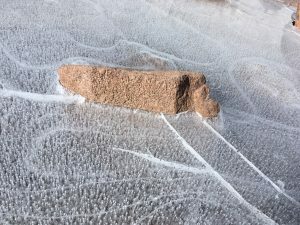 I don’t know how it formed, and haven’t seen it in other frozen Sierra lakes this fall.